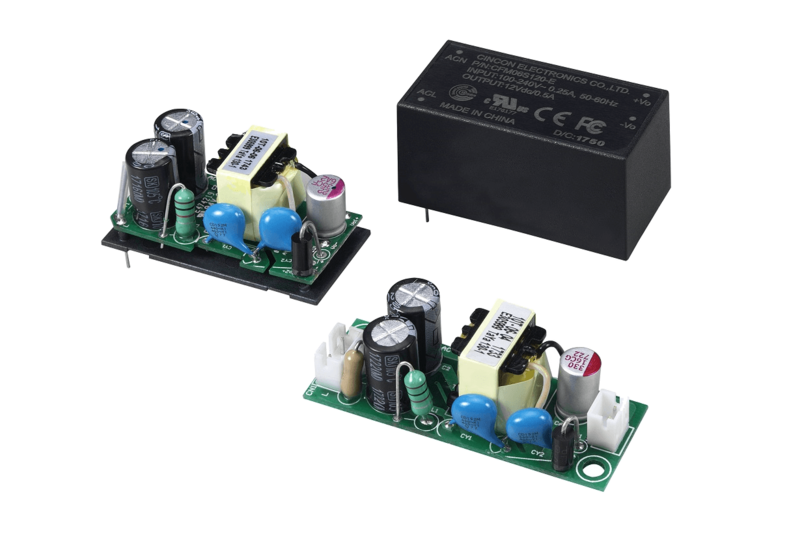 The CFM06S series is our new 6Watt high-density class II AC/DC power supply that provides 6W of regulated power in an 1.555x0.764 inches(39.50x19.40mm) dimension. It has approved of IEC/UL/EN 62368-1, and meets EN61558(60335), and also tested for EN61000-6-3:2007+A1:2011 and EN61000-6-4:2007+A1:2011+AC:2012. It is available in 6 outputs of 3.3, 5, 9, 12, 15, 24VDC, and optional versions of PCB mount, Wafer (-T), or Encapsulated(-E). The power supply offers an extraordinary high efficiency of 81%, and a very wide temperature range of -40°C to +70°C., While going as high as +50°C at full rating, it covers most of the extreme environments. This power supplies can be used at a high altitude up to 5000m max, and also features a low no load input power consumption less than 75 mW. Output over-voltage, output over-load and continuous short circuit protection. This new product suitable for applications in lighting, automation and process control, instrumentation, set-top boxes, household devices, home automation and test & measurement equipment, while their miniature size, high efficiency and low no load input power consumption makes them also suited for IoT applications.